Distribution: Rainforest from central New South Wales to southern Queensland. Name: Brachychiton...from Greek, brachys, short and chiton, a tunic, a reference to the coating on the seed. Brachychiton is a genus of 30 or more species, most of which occur in tropical parts of Australia in dry areas or in rainforest. They are large shrubs or trees. 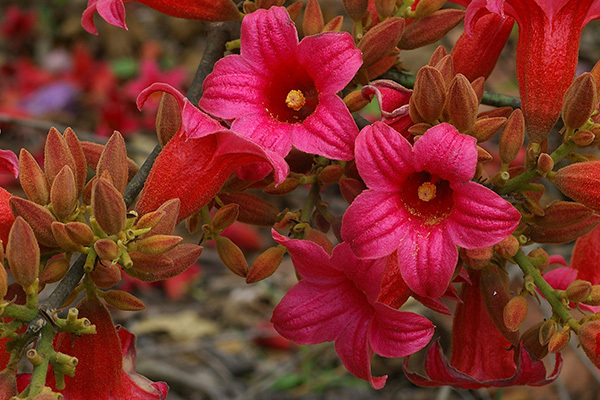 One of the most commonly cultivated is the Illawarra flame tree (Brachychiton acerifolius) which is popular due to its spectacular crimson flowers. The Kurrajong (B.populneus) is one of the most widely distributed and is also a common tree in cultivation. Lacebark is a medium sized tree to about 20-30 metres. Leaves are about 100 to 150 mm long and deeply lobed. The large, bell-shaped flowers are usually deep pink and occur in clusters at the ends of the branches. The flowers are very spectacular and are followed by seed capsules which contain many large seeds. B.discolor is reasonably common in cultivation and is hardy in a range of climates although it may be slow growing. It is partly to completely deciduous before flowering, similar to B.acerifolius. It tolerates a range of soils. Propagation from seed is relatively easy without any pretreatment. The seeds are surrounded in the capsule by irritant hairs and are best collected using gloves. Propagation may also be carried out by grafting onto B.acerifolius or B.populneus.